Eggplant Ossobuco, Mushroom Bolognese, Green Farro, Goat Cheese: A clever visual pun and tasty enough to make you not miss the meat, this vegetarian primi offers a heart of palm “bone” and a caramelly roasted slab o’ eggplant as the veal. That’s circled by the richest mushroom Bolognese you might imagine. Who needs meat when the sauce can be this flavor-thick? Braised Monkfish, Saffron Spiced Tomato, Black Olives, Fairy-Tail Eggplant: The “poor man’s lobster” ends up in this rich dish that seems to have swum a circle ’round the Mediterranean to pick up all its flavors and ingredients. Practically a stew, still that monkfish is the star. 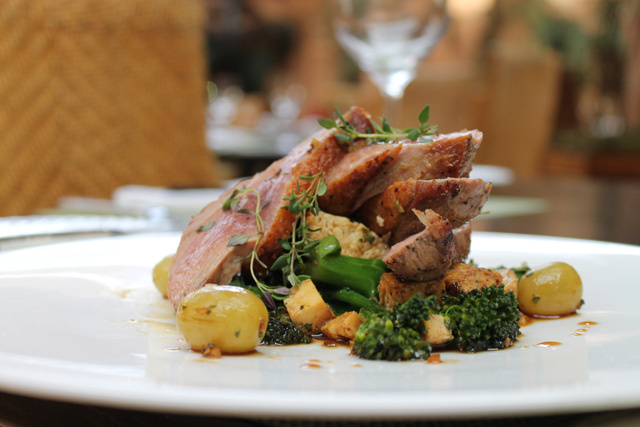 Liberty Farms Duck Breast, Roasted Grapes, Broccolini, Blis Maple: A classicist’s dish — duck with maple — but seldom is it prepared better: The skin crackly crisp, the meat succulent, and then the grapes make it clear you’re in wine country. Plus, they’re roasted, and that adds a spicy dimension no mere fresh fruit has.